Ecstatic; happy; joyful; thrilled; delighted. We can use all the adjectives that allude to happiness but that still will not come close to how Hooch, the pit bull felt when he finally arrived at his forever home. FINALLY! He has been adopted and will have a chance to live a life this sweet dog deserves; a loving family and wonderful home with a big, big yard to run around in too! It is such a joy to watch this awe-inspiring video and see just how much happiness can be felt by a dog. 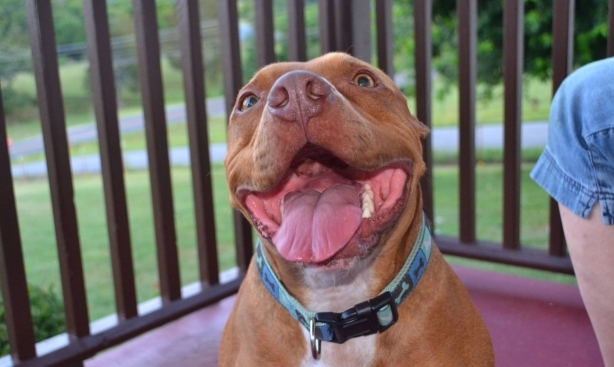 There are millions of rescued dogs in America and pit bulls are in the category where not many get adopted because of the bad reputation that they unfairly have been branded. Watch as Hooch gets a serious case of the “zoomies” and can’t contain his excitement at his newfound freedom. He zips around so fast that his human has hard time keeping the camera on him. Responses to "Abandoned Dog Becomes Deliriously Happy When He Finds A Forever Home"
Wonderful, to see him so happy! He looks very happy.Glad he has a forever home. So much room to ruuuuuuunnnnn! He seems very energized and happy.